Rafael Cusi has long been considered an esteemed “Master of the Watercolour Painting.” His paintings are fresh and extemporaneous, revealing his insightful understanding of light and color. Cusi dominates the atmosphere of the painting with ease, equally effective in all subjects: genre scenes, marines, nudes, abstracts and landscapes. The viewer is instantly drawn into his rich artistic opuses were his artworks are beautifully rendered, in a simple, direct and natural, gestural manner that reveals his interest in the particular medium. He paints the world and events around us, presenting us to the great mystery of watercolor painting, the most difficult gasping discipline. Watercolor is one of the most thought-provoking artistic medium to tackle. It takes much accuracy, creativeness, and emphasis to achieve such a masterpiece. And Rafael Cusi knows how to wield the water-based medium very well. His groundwork process is a vital part of his conceptions: clearing his mind, body and soul of all thoughts that could pose as deterrent to his ardent attention on his canvas and what his stirred intelligence wants to create. Growing up in Mindoro, not only was he surrounded by water, he has actually gone deep into the sea’s unseen cavities. Hence, when he paints his “Underwater” masterworks, it is not a vicarious experience but; undeniably, a revival of his childhood and adolescence. Eventually, when the artist comes up for air, as he might be, he presents us with oceanic still life that he has actually observed, and not merely imagined. Cusi wields a variety of brushstrokes, from gentle and serene to wildly gestural and swaggering, eliciting surprising impressions of corals, shells, planktons, and sea anemones. 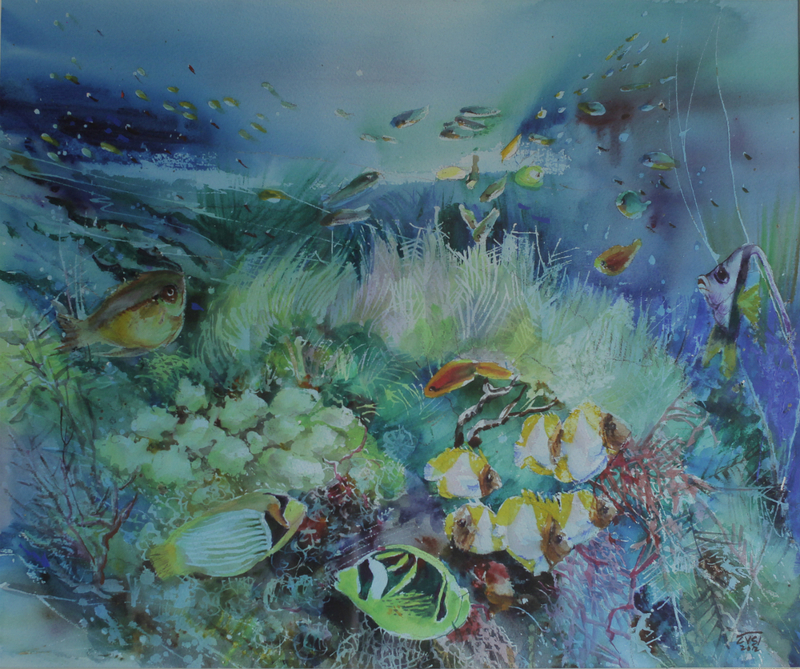 The “Underwater” series, so appropriately titled, partakes of the sweeping grandeur of monumental marine themes as though the artist himself were diving the Philippine coral reefs. 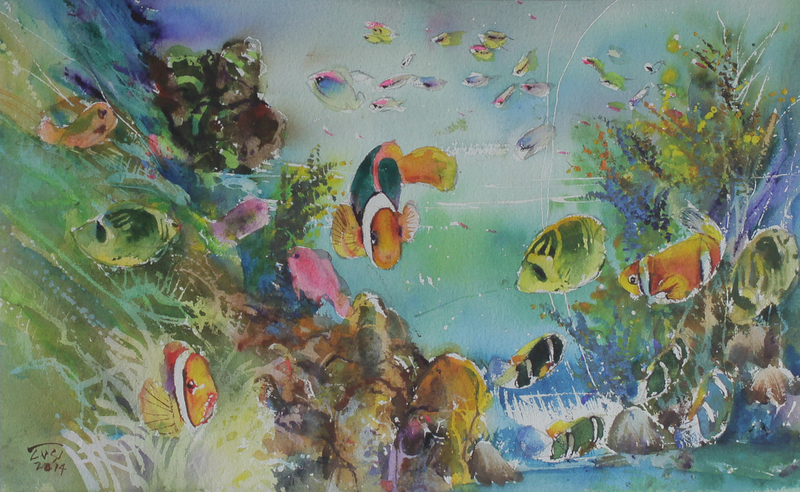 Rafael Cusi’s “Underwater Watercolor on Paper 2012” was published in a book “Revisiting Mabini Art“ which depicts the underwater scene and the coral reefs of the Philippines. Like a true master of the medium, Rafael Cusi celebrates the density and clarity of his subject: the underwater world.